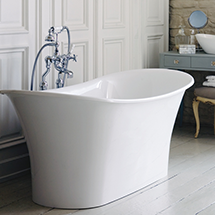 Victoria + Albert is a British brand with a worldwide reputation for creating beautiful freestanding baths and basins – the ultimate statement in quality and style. Victoria + Albert is at the forefront of international luxury bathroom design, and sets the tone for the perfect bathing experience in your home. Victoria + Albert’s product line-up is packed with inspirational free-standing designs made from 100 per cent QUARRYCAST®, a blend of Volcanic Limestone™ and high-performance resins. Naturally white, each item is individually hand-finished by craftsmen. By choosing Victoria + Albert you can relax – you’ve made an investment that will last a lifetime.